At Left: F40PH #406 in Phase III Heritage paint scheme. This locomotive class was the premier power during the 1980s and early 1990s. 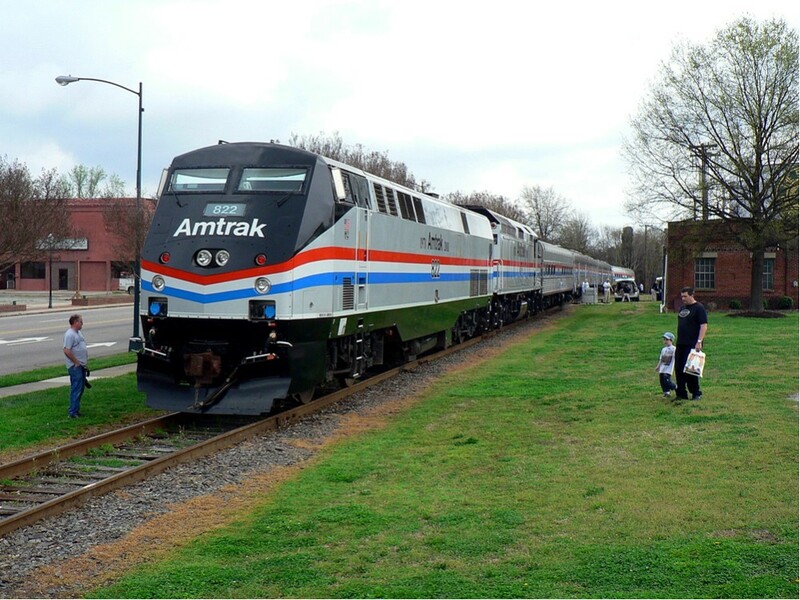 For those of us at the half century mark or more in age, the forty years since the inception of Amtrak has been an amalgam of changes. Moreover, there are generations of Americans that have not known any other national rail passenger carrier. But May 1, 1971 is a landmark date in the history of American railroading for Amtrak was the phoenix that rose from the ashes of a national passenger rail system that had declined steadily since the end of World War II. Ridership by the end of the 1960s was a mere trickle and the freight railroads could not shed this operational and financial drain from operations quick enough. Except for a couple of Class I railroads that maintained passenger service for several more years such as the Southern Railway, the remainder ran their final passenger trains on April 30, 1971. The federal government stepped in to maintain a national passenger network and that creation was Amtrak. Typically when a 40th anniversary is celebrated, the notion of success is a foregone conclusion. But the term "successful" has a different meaning with Amtrak. It is primarily a success simply because it still exists. That said, it is not my intent to use this page as a political pulpit to debate the pros and cons of Amtrak but instead, to state what is in question with respect to that existence. Often criticized as a white elephant of the federal bureaucracy, it has been controversial throughout its life span because of federal funding, equipment quality, performance, and ridership. The bottom line, however, is the fact that it is the only national rail service we have at present and forty years is an achievement worthy of history by any measure of success. The Exhibit Train tied down on NCTM track. In addition to the Heritage P40 and F40PH motive power, the train consists of a sleeper, three baggage cars, and an Amfleet Cafe car modified for exhibition. There is also a gift shop with shirts, trains , and other memorabilia. Dan Robie 2012. Among the most interesting exhibits inside the train were HO scale models of various Amtrak train consists through the years. These are secured inside clear plexi-glass tubes to prevent damage or theft. Walthers donated the scale models for display; not coincidentally, several of these scale models are for sale in the gift shop. Operation Lifesaver was on hand during this event as it generally is at all rail shows and exhibits at the NCTM. 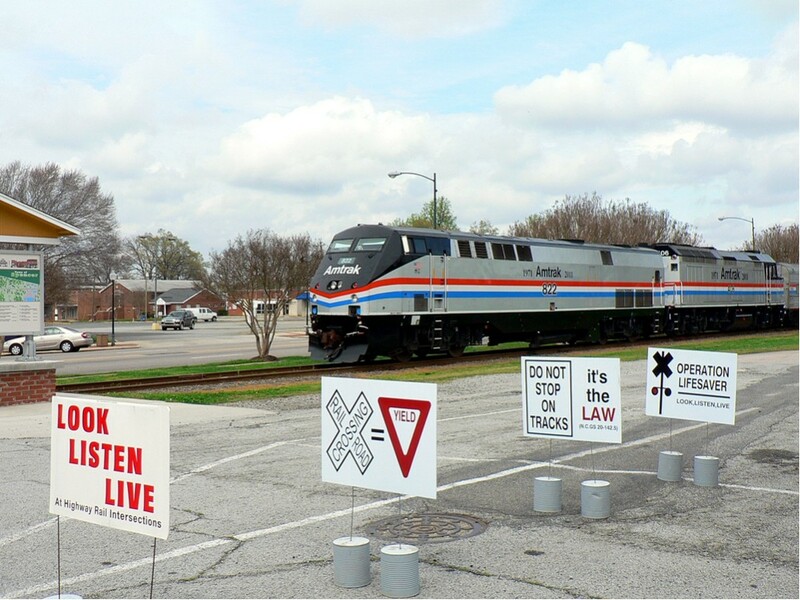 This organization does an excellent job of educating the general public about grade crossing safety and the dangers of trespassing on railroad tracks. These functions are the best domain to inform the public and to distribute safety literature. With regards to the Amtrak 40th Anniversary Exhibit Train, it is most impressive. 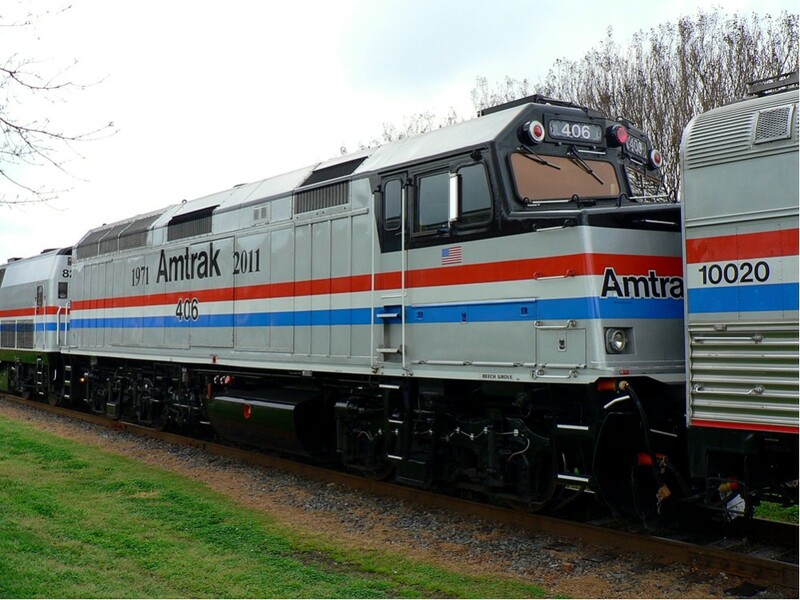 Amtrak is not only to be commended for its presentation but also for the additional step of repainting several of its locomotives in Heritage paint schemes to commemorate its forty years of existence. A job well done and I encourage anyone with even a passing interest in railroads to visit this exhibit when it comes to your area. Admission inside the train is free although there could be a general fee at the location that hosts the event.